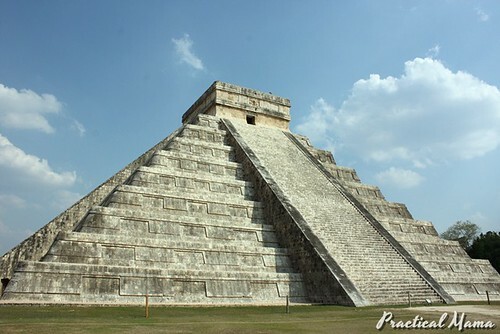 Chichen Itza is one of the biggest and well-preserved archeological sites from Mayan Civilization that is quite close to Cancun. Since the world didn’t end on 12.21.12, we decided to visit the site during our vacation in Cancun. 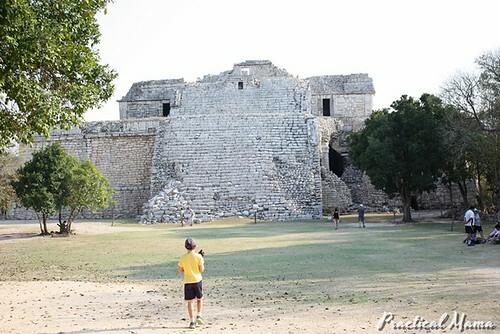 We had a rental car and it took us about 2 hours to drive from Cancun to Chichen Itza. The roads were very well paved and marked. We used the toll-way. Chichen Itza is quite inland, so it was much hotter when we arrived there. There is a very nice restaurant and nice shops outside the site. We had a big lunch with traditional food. We had two big bottles of water, which was finished pretty quickly, so better pack those water bottles if you are traveling with children on a hot day. There is a parking fee. The entrance fees were a little bit complicated. You pay one entrance for the state, one for federal government, at separate windows. 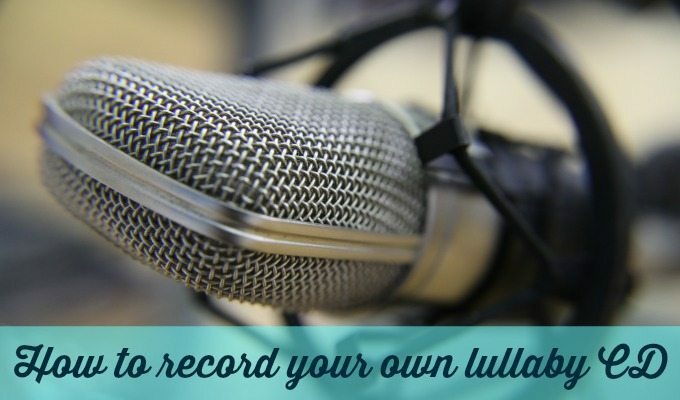 If you want to tape a film, you have to pay and obtain permit. You need cash for federal fees and permit. Once you pay and get both tickets you can enter enter the archeological site. 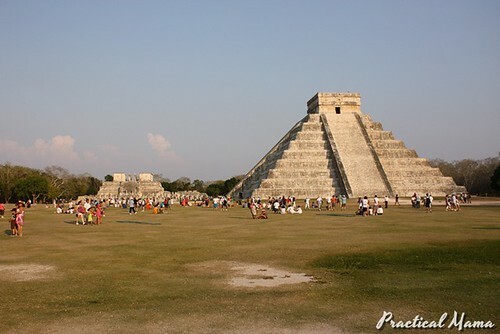 The picture shows the layout of the monuments at Chichen Itza. 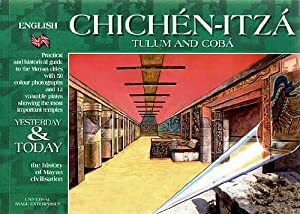 Before visiting the site, I got this “Chichen-Itza, Tulum and Coba: Yesterday & Today” book from the store at the hotel. 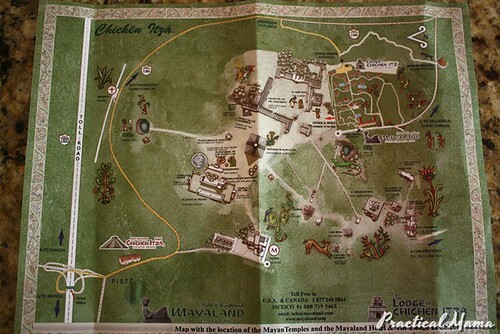 It not only shows the map, photos and explains the history, but it also has plates showing what the temples looked like back in the day, that overlaps with the current photos of the temples and buildings. 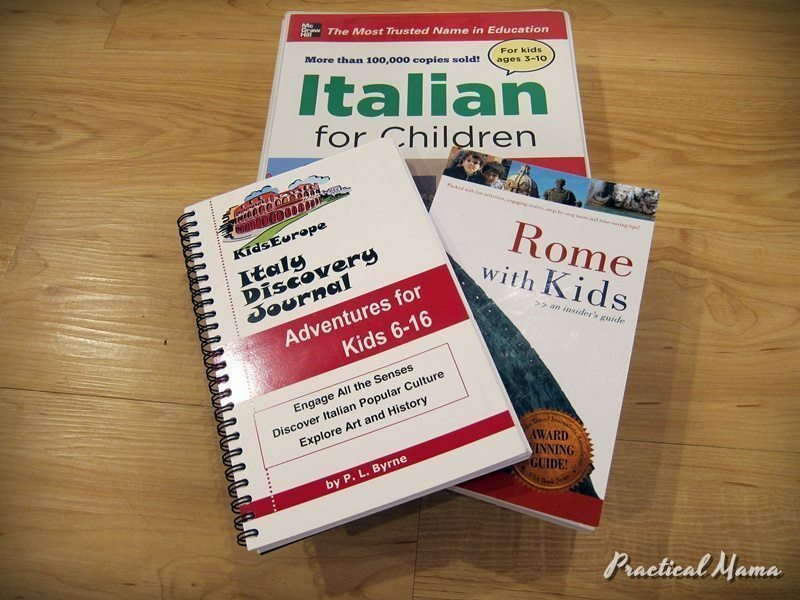 We read it together with the kids in the car before visiting the site. 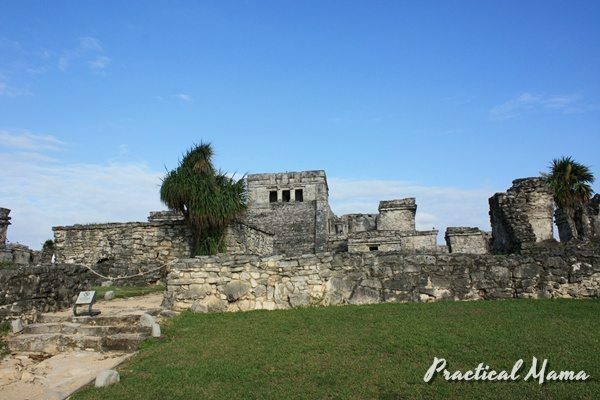 If you are visiting with children, I highly recommend reading and learning about Mayans, the temples and monuments at archeological sites. 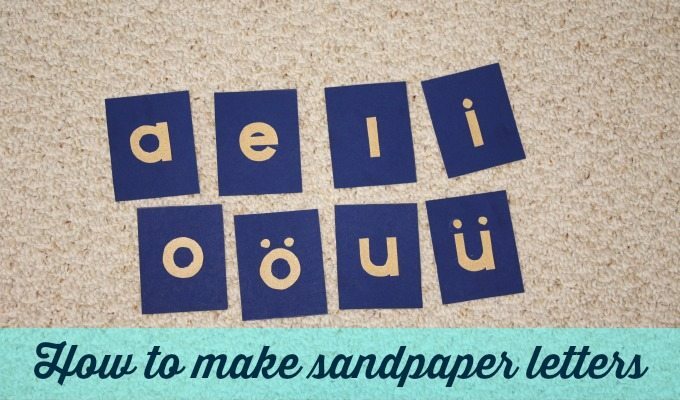 They would not only know what they are looking at, but also you can create a bingo or scavenger hunt type of activity to keep them going. in that sense, the book we purchased really helped us visualize what the remains looked like in color (most of them were painted). 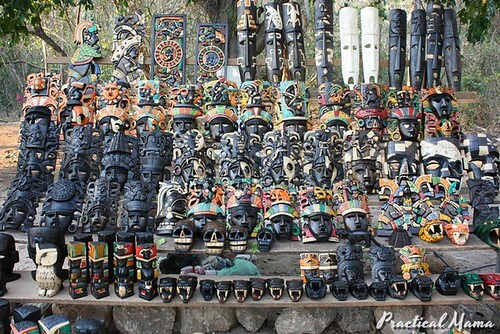 You are welcomed by rows of handcrafted souvenir tables. 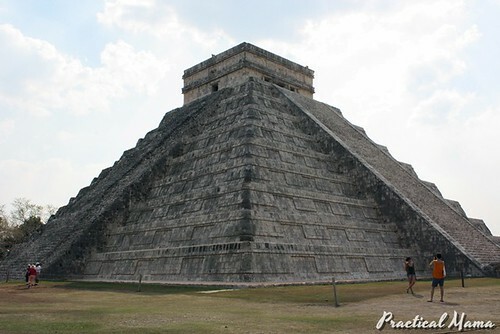 Then you see the big pyramid, which is called Kukulkan Pyramid or El Castillo. 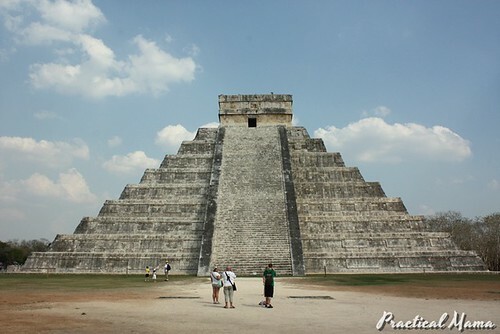 It is considered one of the “New 7 Wonders of the World”. It was very impressive. Almost intact except for the stones on the stairs. Visitors could not climb up though, which is understandable. 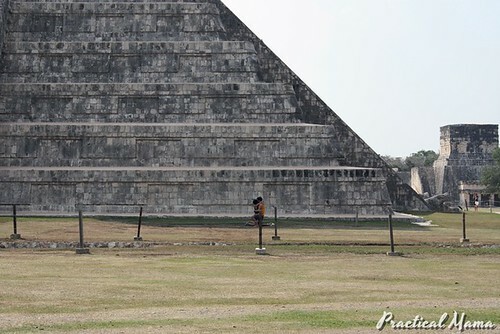 Kukulcan Pyramid from another perspective. We followed a tourist group with a guide explaining some surround sound /echo trick in front of the pyramid. When you stand, right in the middle on a marked circle and clap, it echoes. Here this girl is posing happily to his boyfriend. Boyfriend waits, until all the other visitors walk away. Next thing, we turnaround to see he was proposing. The girls said yes and we all applauded. Such a happy touch on our visit. 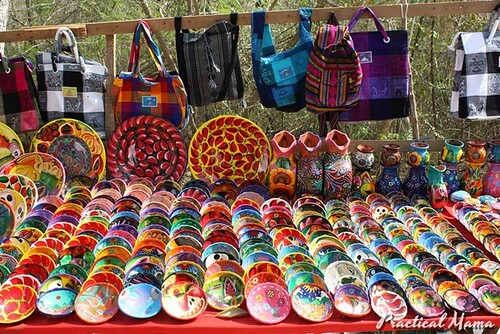 The masks were very very nice. 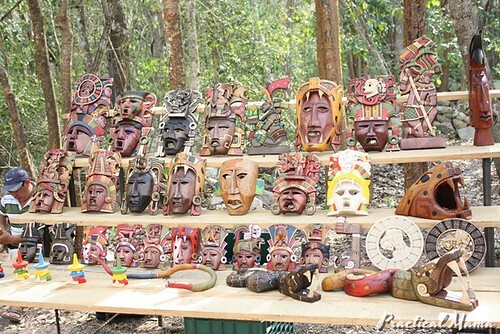 In some cases, we saw the men actually carving the masks from the wood. If only I had a place to hang. 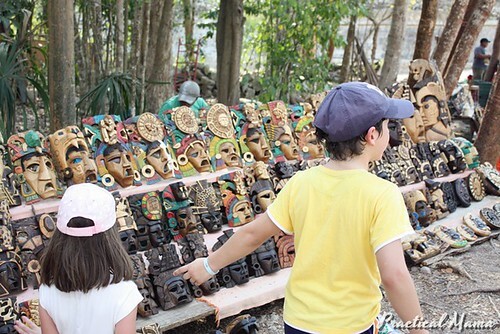 My kids begging us to buy some souvenirs. Finally, we got my son a wooden jaguar and a stone pyramid for my daughter. 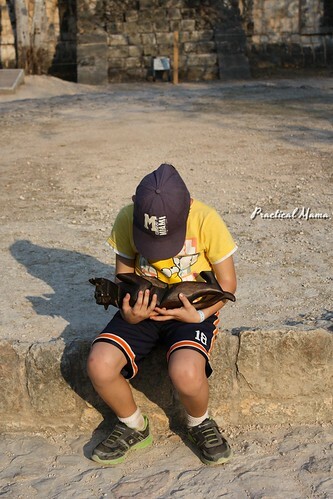 My son was so enamored with his jaguar. 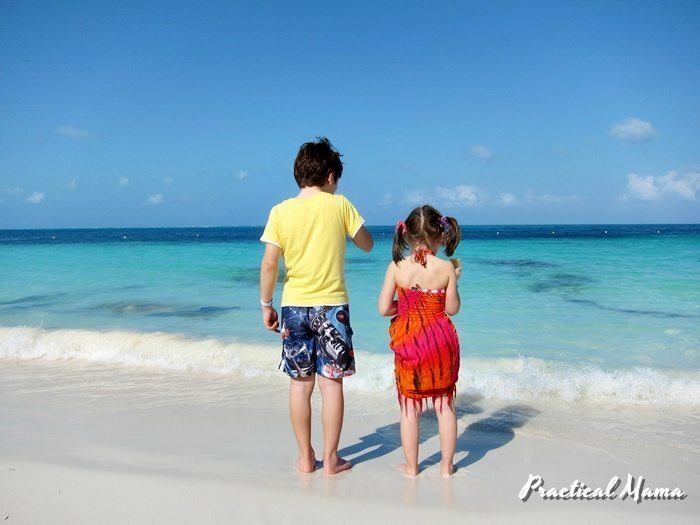 Now we can walk around without having to hear them -my children – begging and nagging. The Nunnery. Famous astronomy building with its big observatory. 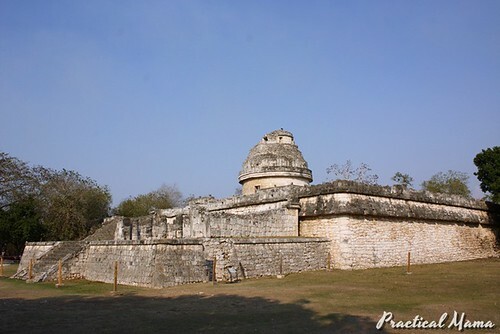 It is called El Caracol. 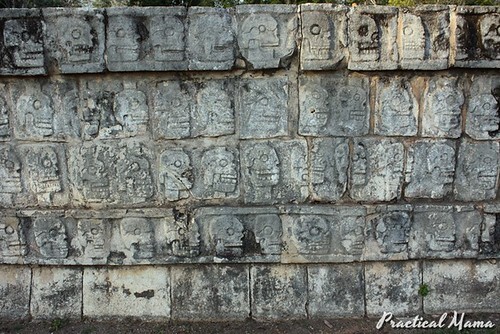 Tzompantli or Wall of Skulls. One last view of the Pyramid and Temple of Warriors in the background. 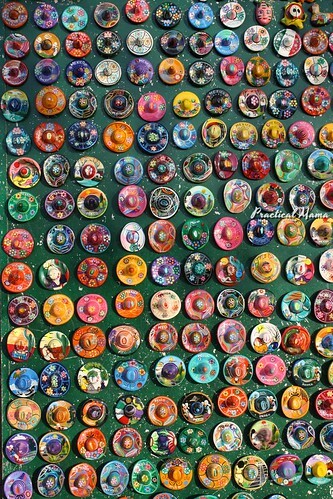 and of course the sombrero magnets. 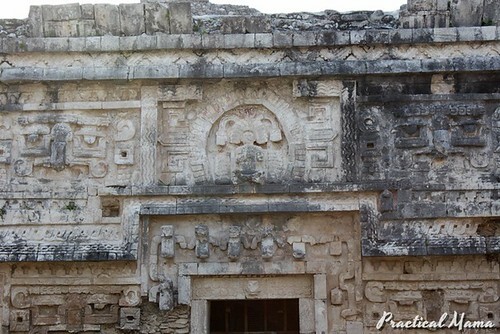 You can see more photos on my Flickr Chichen Itza Album.